Functional and Attractive Fences that Last! BroadShield specializes in fencing of all types and materials. Fencing is a necessity in rural and ranch living to stake out and protect your property. Many of the popular fences we offer vary from high or deer fencing, metal pipe fencing, barb wire, wrought iron fencing, and wood. 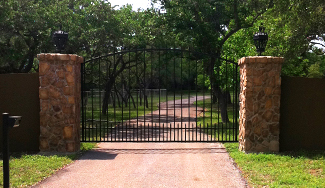 Our team has built fences for a few feet up to miles of ranch-enclosing fences all across South Texas and has the resources and expertise to get your fence built in a timely fashion at a competitive price. As expected, we use only the highest grade materials, and our installation team are employees of BroadShield as to assure quality and customer satisfaction. Our metal fences are custom fabricated and installed on site.